Do you remember the well-being of the silence? Can Dalemus is located in Veïnat Soliva surrounded by two mountains and in front of a plain. It is delimited by the irrigation cannel of Sils. 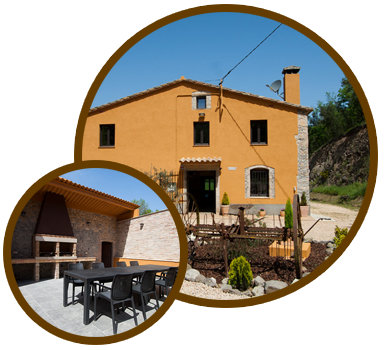 Can Dalemus is a Catalan farmhouse built in 1839 and recently restored with a personal style reconstruction because it is not necessary to resign the comfort and to maintain the tradition. 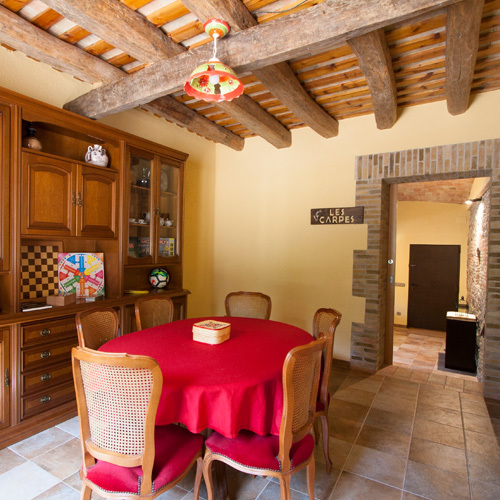 Enjoy the privacy in an excellent environment with 130.000 m2 of forest and field that surround the farmhouse. Leave your everyday stress and enjoy in a natural environment. Experience the magic and count the stars! For your memory, just live the experience! Kitchen fully equipped: fireplace, table and chairs up to 15 people, induction cooker, oven, fridge – freezer, dishwasher and all necessary kitchen tools. Spacious Dining-room and living room equipped with comfortable sofas, TV 43', tables and chairs up to 15 people. Games room: friendly space with a great variety of table games, to spend time while interacting with other people and not with technology… despite we have Wi-Fi..
Room equipped with washing machine, washing line and iron. Enjoy a barbecue with outside tables and chairs while having a vermouth, a meal or having a conversation in the shade under the trees. Alleviate rheumatic and muscular pains. Improve blood circulation and breathing capacity.